How to interpret the p-value of a statistical test? Do I need to adjust p-values when performing multiple testing? What method can I use to correct my p values? Analyzing data in biological sciences often involves statistical tests which notably return a p-value. When the p-value is lower than 0.05 (p ≤ 0.05), you may consider that there is a good chance that the observed data do not match the tested null hypothesis, with a < 5% risk of being wrong. Conversely, when the p-value is higher than a given threshold (say p > 0.05), all you can conclude is that your data do not show any significant differences. This does not mean no difference exists; indeed, it is likely that your test is not resolutive enough (see section to go further, below). p > 0.05, does not mean there is no difference. Without an estimate of the probability to miss a genuine difference, aka the risk β or type II Error, all you can conclude is: ” we cannot show a significant difference between parameters.” To estimate the risk β, one may use statistical softwares such as G*Power . (http://www.gpower.hhu.de/en.html). Getting a p-value lower than 0.05 is not necessarily the point you want to make. The size of the effect crucially matters. For example, in a large sample (say, n > 100,000) a p < 0.05 may correspond to very subtle differences, while in practice they may be of little relevance. Conversely when p > 0.05, one may reasonably think that any differences that are not detected by the tests are likely to be very weak. It is common for a biologist to perform numerous tests simultaneously, e.g., comparing the expression of thousands of genes and/or comparing multiple experimental groups, etc. Keep in mind that if you perform, for instance 100 tests, you expect to get 5 tests where p < 0.05 but in which no genuine difference exists. Therefore the general answer is “Yes, you need to account for multiple testing”. Case 1: imagine you want to make a list of potential candidates markers. Then, for the sake of criteria, you could hunt the k lowest raw p-values and use adjusted p-values as an additional information. Case 2: the aim of your study is to provide a reliable shortlist of biomarkers, then you might want to be conservative and base your conclusions on the adjusted p-values. 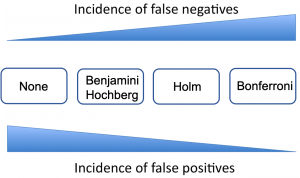 Doing so, you may reduce the amount of false positives among the multiple tests. Choosing a convenient adjustment method depends on the type of data as well as on and the amount of false discoveries you are ready to accept, see Figure 1.